For this class we were paying guests, not volunteers! Watching the quantity of dishes being washed I decided I was OK with this. We just sat back, talked with our tablemates and admired the plates as they arrived. The chef was Jim Kowalski, chef-about-town and employee at the fabulous Breadfarm Bakery in Edison. 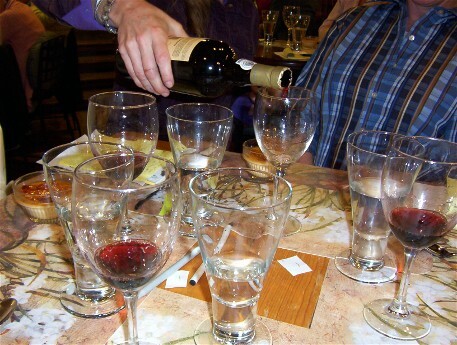 Wine was chosen by Renee Stark of Noble Wines. 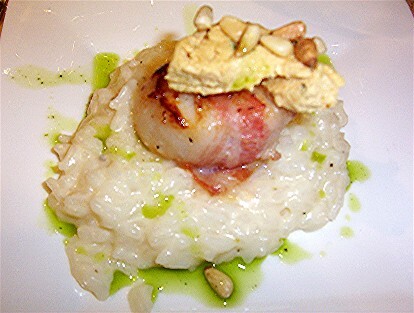 The first course was a single, large scallop, wrapped in pancetta and cooked in a hot pan, set atop a pile of snow-white risotto, with a pat of compound butter studded with pine nuts and drizzled with freshly made basil oil. The compound butter was interestingly flavored, with a mix of pumpkin puree and pumpkin seed butter. The wine (I forgot to write them down, whoops) was a crisp but full-flavored white from Italy. I think. The entree was a small plate with a small heap of roasted yellow spaghetti squash, topped with slices of perfectly cooked pork tenderloin, a scattering of “micro-greens” (read: sprouts) and a drizzle of a reduced cider and wine sauce. I forgot to take a picture of this one – everyone at my table scarfed theirs immediately. There was a very nice pinot noir to go with it. 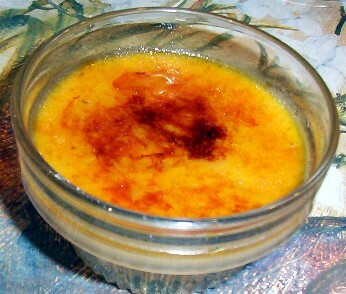 Finally, dessert: crème brûlée with pumpkin puree and a bit of cinnamon. Basically, pumpkin pie with a sugar crust. Tasty, but I personally find it hard to improve upon a simple slice of pumpkin pie with whipped cream. It was served with a really yummy tawny port from New Zealand. I’ll try to keep better track of my wine notes in the future!